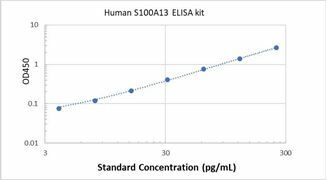 Specificity This assay has high sensitivity and excellent specificity for detection of Human S100A13 . No significant cross-reactivity or interference between Human S100A13 and analogues was observed. 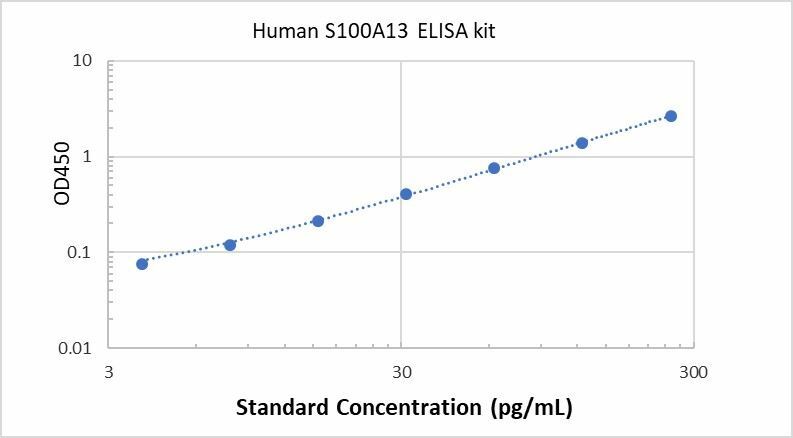 Typical Data ELISA: Human S100A13 ELISA Kit (Colorimetric). These standard curves are provided for demonstration only. A standard curve should be generated for each set of samples assayed. Background The protein encoded by this gene is a member of the S100 family of proteins containing 2 EF-hand calcium-binding motifs. S100 proteins are localized in the cytoplasm and/or nucleus of a wide range of cells, and involved in the regulation of a number of cellular processes such as cell cycle progression and differentiation. S100 genes include at least 13 members which are located as a cluster on chromosome 1q21. This protein is widely expressed in various types of tissues with a high expression level in thyroid gland. In smooth muscle cells, this protein co-expresses with other family members in the nucleus and in stress fibers, suggesting diverse functions in signal transduction. Multiple alternatively spliced transcript variants encoding the same protein have been found for this gene.